If you have an outdoor enthusiast on your gift list, then check out these great gifts from the most-trusted name in the outdoor/fishing industry – Rapala, a company born more than 75 years ago when it created the first balsa wood lure, which is widely used today. With the holiday season fast approaching, the inevitable last-second rush to find gifts for friends and family isn’t far behind. This year, don’t panic. Instead, hook up your loved ones with the latest and greatest gear from Rapala®, the most trusted name in fishing. According to a recent study from the Recreational Boating & Fishing Foundation and The Outdoor Foundation, in 2013 alone, nearly 46 million Americans from all walks of life grabbed a tackle box, picked up a rod and made way to their local honey hole in search of a wall-worthy trophy fish. And, it’s not just the stereotypical angler looking to spending time on the water — 42 percent of all new fishing participants in 2013 were women. With that many Americans enjoying the sport of fishing, there’s sure to be a slew of avid anglers and excited beginners on anyone’s holiday shopping list. Offering affordable lures and fishing line perfect for stocking stuffers, functional accessories and apparel, and show-stopping, big-ticket items, Rapala and Respected Rapala Brands is sure to have the perfect present for any outdoors enthusiast. Stuff any angler’s stocking full of Scatter Rap® lures and you’ll guarantee a holiday they’ll never forget. When legendary lure manufacturer Rapala® released the series in 2013, the angling world immediately took notice of the lures’ one-of-a-kind “Scatter Lip™”, which gives the baits their celebrated evasive, side-to-side, erratic swimming action. And, it wasn’t just talk. The lures landed an IGFA World Record right off the bat and, during the five-day Scatter Rap Challenge, the lures caught more than 1,000 fish. 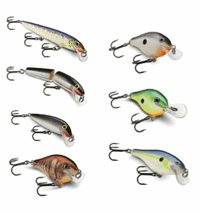 Now — just when anglers didn’t think it could get any better — Rapala has expanded the Scatter Rap Family with the new Scatter Rap Jointed, th e Scatter Rap Crank Deep and Crank Shallow and a new smaller-sized Scatter Rap Shad (No. 5), ideal for a finesse presentation. Cast or trolled, the series comes ready to fish right out of the box with an aggressive swimming motion that perfectly mimics a spooked baitfish fleeing attack. 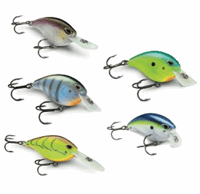 Scatter Rap lures are available in five trusty Rapala body profiles and 18 attractive colors. With more than 1.5 million lures sold worldwide last year, when anglers tie on a Scatter Rap lure, they’d better have a net at the ready. They’re going to need it. Designed with insights from 2013 Bassmaster Classic runner-up Brandon Palaniuk, the Storm® Arashi™ Series gives anglers a host of dynamic cranks that will hook behemoth Bass in any scenario. Expanding the already legendary Arashi lineup, this summer Storm introduced the new Arashi Wake Crank, a hard-rolling lure that swims just below the surface, causing major surface commotion as it creates a large wake that draws the attention of the big, bruising Bass anglers dream of. With the debut of the Wake Crank, the Arashi Series now offers anglers the perfect bait for targeting every part of the water column. Go deep with the Arashi Rattling Deep 10, hit the medium depth range with the Flat 7, pound the shallows with the Rattling Square or Silent Square 3 and 5 or terrorize fish by tying on the Wake Crank for a topwater presentation. All Arashi lures come equipped for game-changing action with a self-tuning line tie, circuit-board-style lip and rotated hook hangers, and are available in 13 eye-catching color patterns. When your friends and family start pounding the water after unwrapping an Arashi crank, they’ll credit their newfound angling acumen to a holiday miracle. Masterfully crafted by legendary Finnish blade manufacturer Marttiini for more than a half century, a premium Rapala® fillet knife is a must-have accessory for the anglers in your life. Used in more fish camps and on more charter boats than any other brand, each Rapala knife is masterfully crafted with a renowned razor-sharp blade that anglers worldwide have grown to trust. With a wide variety of specialty blades available, fishing fanatics can find a knife for any application — from simple fillet chores to cleaning larger, boney species. Choose from beautiful, ornamental knives like the Rapala Classic Collector Fillet or dependable knives for everyday use such as the Fish Camp Fillet and Deluxe Falcon™ Fillet. A gift that will be used time and time again, Rapala fillet knives are like a shortcut to the frying pan. For gifts guaranteed to make this holiday season a memorable one — including the items above— visit your local sporting goods store to find Rapala and Respected Rapala Brands gear or check out www.rapala.com to order directly. For special offers, tips and techniques, new product information and more, connect with Rapala on Facebook at www.facebook.com/rapalausa.